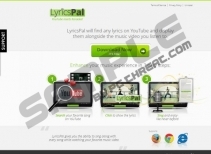 If you have installed LyricsPal, be ready for a barrage of various LyricsPal pop-ups and other forms of advertising. We recommend that you remove LyricsPal from your computer because this application is ad-supported, which means that it sends various advertisements to the user’s computer. Due to this quality, LyricsPal is regarded as an adware program, and you can get rid of it by implementing our recommended spyware removal tool. 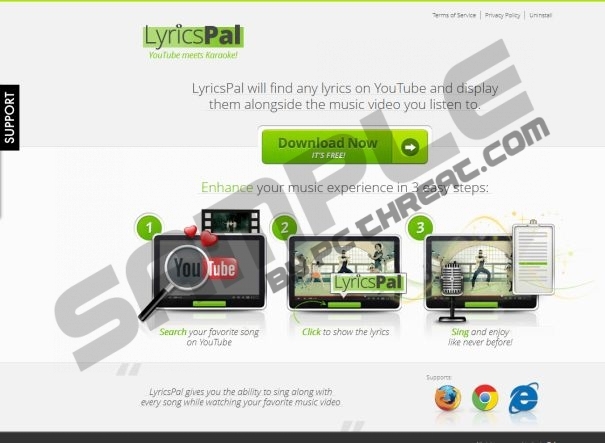 LyricsPal is a browser add-on which search for the lyrics of the videos on YouTube, and if the text is found, a Show Lyrics button is added on the right side of the video. The application is also known as LyriXeeker and LyricStar, and LyricsBuddy. LyricsPal pop-ups can appear on Internet Explorer, Google Chrome, and Mozilla Firefox, and if you own all these internet browsers, you are likely to have a difficult time trying to bypass all those annoying advertisements. Moreover, keep in mind that LyricsPal pop-ups and other ads can be generated according to your search terms. The application monitors your browsing behavior; more precisely, it reads your browsing history and records your search queries and other non-personally identifiable information. According to the developers of the browser add-on, the information is being collected in order to optimize the service and provide the user with targeted advertisements. If you want to use the Internet as usual and get rid of LyricsPal pop-ups, you need a powerful spyware removal tool. We recommend that you use SpyHunter because it can easily eliminate LyricsPal from the browsers and shield the system from various computer threats. It’s not a secret that you can uninstall the program, but how are you going to ensure protection from various computer threats? A reliable anti-spyware is a must, so if you want to be safe on the Internet, implement the recommended spyware removal tool right now. Click Start - > Control Panel -> Uninstall a program. Remove the unwanted program to get rid of LyricsPal pop-ups. Start typing in control panel. Click the Control Panel icon and select Uninstall a program. If you have used these instructions to get rid of LyricsPal, click on the button below to download a scanner which will scan the PC so that you can make sure that all the components of the unwanted program are removed. Quick & tested solution for LyricsPal pop-up removal.